A-HOTEL.com - Luxury and cheap accommodation in Bogatishchi, Russia. Prices and hotel, apartment booking in Bogatishchi and surrounding. Kontinent Hotel is set in Voskresensk and features a garden and shared lounge. With free WiFi, this 3-star hotel offers a 24-hour front desk. Featuring accommodation with a balcony, Апартаменты на сутки. Is located in Voskresensk. Situated in Voskresensk in the Moscow region region, Apartments on Pionerskaya has a balcony. Guests staying at this apartment have access to free WiFi and a fully equipped kitchen. Voskresensk Hotel provides accommodation in Voskresensk. The accommodation offers a 24-hour front desk. Apartment per hour provides accommodation with a terrace and free WiFi, and is set in Voskresensk. All units include a fully equipped kitchen, allowing guests to prepare their own meals. Located in Fedino, Hotel А108 27 KM is 5 km from Krivyakino Estate. All rooms boast a flat-screen TV with cable channels and a private bathroom. Situated in Voskresensk, Hotel А108 Voskresensk features free WiFi. All rooms feature a flat-screen TV with cable channels and a private bathroom. Arm-Prestige is offering accommodation in Kurovskoye. Featuring a 24-hour front desk, this property also provides guests with a restaurant. Set in Voskresensk, Гостиница Воскресенск offers free WiFi. The accommodation provides a 24-hour front desk. Business-hotel Voskresensk is offering accommodation in Voskresensk. This 3-star hotel offers a 24-hour front desk and free WiFi. Offering a sauna, Domino Inn is located in Yegoryevsk. The property provides free WiFi and free private parking. Offering free WiFi, Hotel on Melanzhistov is set in Yegor'yevsk. A sauna is available for guests. 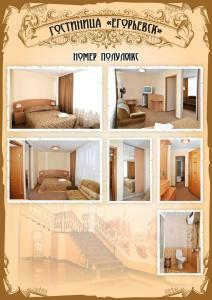 Situated in Yegor'yevsk in the Moscow region region, Olimp features accommodation with free WiFi. A continental breakfast is served daily at the property. Apartment on Lomonosova 92 is situated in Perebatino. The accommodation is 25 km from Kolomna. Featuring accommodation with a balcony, Apartment on Lomonosova is situated in Voskresensk. Free WiFi is offered. Offering free WiFi, Komfort is set in Yegor'yevsk. Selected rooms are fitted with a kitchenette with a microwave, a fridge and a stovetop. Hotel Yegoryevsk is located in Yegor'yevsk, 90 km from Moscow. Guests can enjoy the on-site bar. Located in Gzhel', Zona Otdykha Ozero Ponti offers a terrace. Providing a restaurant, the property also has a shared lounge and a bar.